The West Coast Trollers Association is a partner in Thisfish, a seafood traceability system spearheaded by Ecotrust Canada. Thisfish sets out to make the seafood business more transparent and, well, less fishy. A growing community of trusted fishermen, fishing organizations, processors, restaurants and retailers—all dedicated to quality and sustainability—is currently testing this innovative system in British Columbia and Atlantic Canada. Thisfish consists of a system to tag seafood and trace it using unique codes from ocean to plate. When fishermen land their catch, they tag individual fish or entire fish lots with a unique code. Information about the fish—who caught it, where, when, how—is linked to the code and uploaded to Thisfish.info. As the fish travels through the supply chain, from sea to supermarket, each seafood business can upload additional information about how it was handled and processed. Ultimately, consumers, retailers and restaurateurs can use the unique code to retrieve details about the seafood they purchase. With Thisfish, what you see is what you get. Thisfish is currently being beta tested by fishermen and processors in British Columbia and Atlantic Canada. The partners include the West Coast Area G Trollers Association, the Pacific Coast Fishermen’s Conservation Company, Canadian Council for Professional Fish Harvesters, Maritime Fishermen’s Union, BC Dogfish Hook and Line Association and the Vancouver Island Seafood Buyers Association. For more information, visit the West Coast Area G fishery page on Thisfish.info. 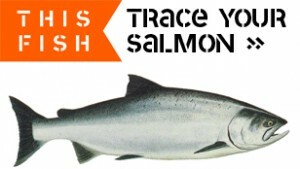 This entry was posted on Monday, January 10th, 2011 at 10:41 pm	and is filed under TROLLING and tagged with traceability, wild salmon. You can follow any responses to this entry through the RSS 2.0 feed.